You, my friends, are looking my Candy Cane truffle—it’s part of my Holiday Collection that’s available in December 2017. To make it, I take the time to infuse mint leaves in rich fresh cream, and then I stir it into white chocolate to make a rich, flavor-filled ganache. Finally, I pour that ganache into a white chocolate shell and then roll that goodness in crushed candy cane. I know—#drool! Gift Idea: Pack this pretty little truffle with a festive mug, a cute wooden spoon, and a couple packs of hot cocoa. 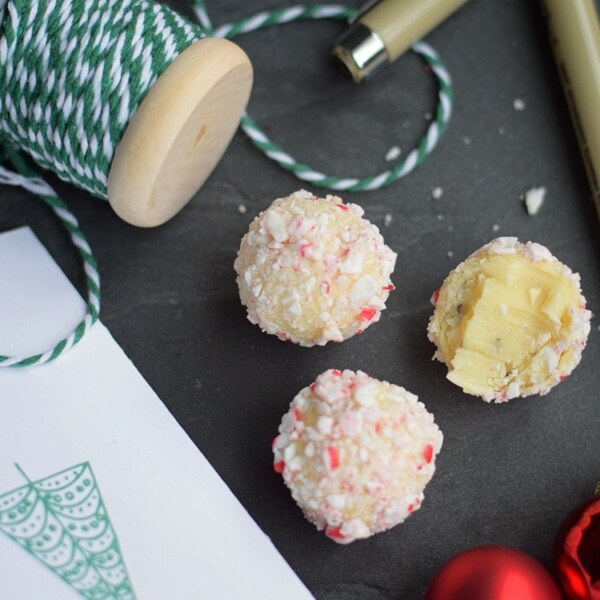 Throw in a candy cane and you’ll be the hit of the party! This entry was posted in Flavor Spotlight, Gift Idea, Holiday Collection. Bookmark the permalink.